The rich and diverse history and heritage of the state of Nebraska through its buildings is the subject of an upcoming presentation at the North Platte Public Library. 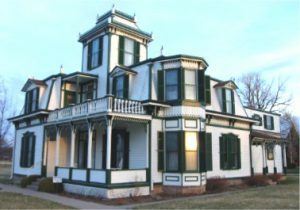 Historian and author Jeff Barnes presents “Nebraska’s Landmark Buildings” on Thursday, May 3, 12:00 p.m., at the library, 120 West 4th St., North Platte. The talk is sponsored by Humanities Nebraska. The talk is free to the public but the library requests seat reservations to help in room set-up. Please call the library at 535-8036, Ext. 3301. The 45-minute talk presents the diversity of the state’s buildings, from an 1830s-era cabin along to its internationally noted state capitol through a state-of-the-art cancer center of today. “The architecture of Nebraska tells the history of the state,” said Barnes. “You can see the boom-and-bust periods, the arrival of various ethnic groups, and the impact of world wars.” Some of America’s greatest architects – from Frank Lloyd Wright to I. M. Pei – also left their mark on the state and are presented. The talk is derived from Barnes’ new book, 150@150: Nebraska’s Landmark Buildings at the State’s Sesquicentennial, a celebration of the built world of Nebraska in its 150th anniversary of statehood. This colorful, richly photographed collection includes the earliest buildings constructed by newcomers to the territory, its most recognizable landmarks, and the newest and most dynamic structures designed by the architectural firms of today. The book is presented by the Architectural Foundation of Nebraska and the American Institute of Architects-Nebraska Chapter. Of interest to those in North Platte, Buffalo Bill Cody’s Scouts Rest Ranch and the Lincoln County Courthouse are included in the book. Barnes is also the author of Forts of the Northern Plains, The Great Plains Guide to Custer, The Great Plains Guide to Buffalo Bill, Extra Innings: The Story of Modisett Ball Park and the centennial history of a Kansas City medical school. He is currently at work on his next book, a travel guide to sites related to the American outlaw Jesse James. A former newspaper reporter and editor, Barnes writes freelance and lives in Omaha. He is a fifth-generation Nebraskan, a trustee of the Nebraska State Historical Society, former chairman of the Nebraska Hall of Fame Commission, and past marketing director of the Durham Museum.